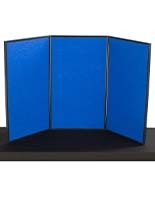 This tabletop exhibit is a great addition to any trade show display! 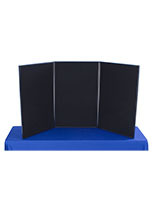 The presentation board, tabletop exhibit has a 3-panel design, providing you with an adequate amount of space for displaying signs, posters and literature-holding accessories. 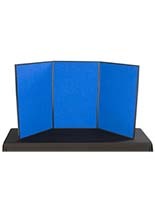 This tabletop exhibit, also known as a folding panel board, has black, hook and loop receptive fabric and magnetic capabilities to make adding signage and accessories effortless. 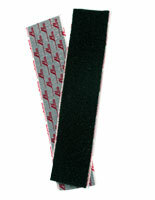 (View the right-hand-side of your screen for acrylic, hook and loop based products.) 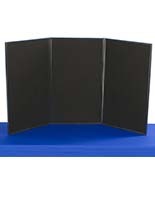 You can customize your presentation by simply rearranging your accessories! 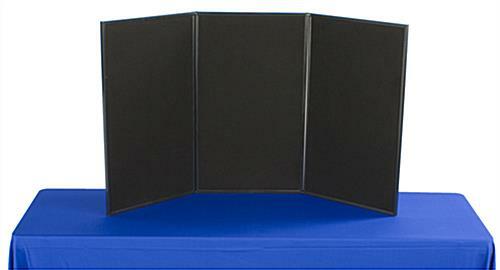 This 3-panel display, tabletop exhibit includes a write-on white board! 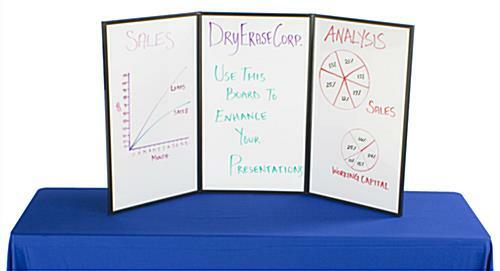 Using dry erase markers, you can draw personalized charts or catchy designs, making your presentation stand out even more! 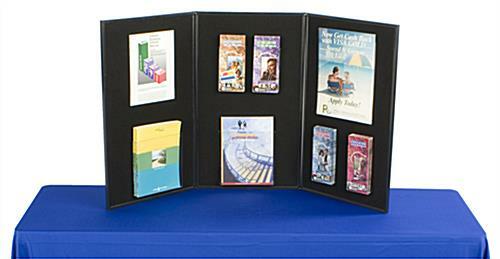 The tabletop exhibit is also sold with its own carry case to make traveling, to and from any event, easy. 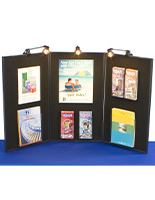 This portable board is a lightweight tabletop exhibit, tradeshow participants will love! 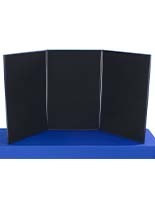 The tabletop exhibit, such as exhibition boards, and folding panel exhibits, is a staple item within any successful presentation. Love the versatility of this board. Thank you so much for the great review, Deborah! 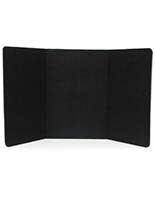 We're glad that you appreciate this board's versatility, from its ultra-portability to its velcro and whiteboard display options. We hope you'll shop with us again soon! This product came well packaged and on time. I like having the carrying case bag, as the board will be used for various educational and promotional opportunities in many locations. 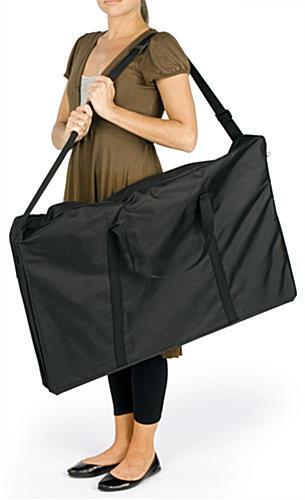 The bag is not of the highest quality, but it is just enough. Overall the product is light weight. I used velcro to display items to board. 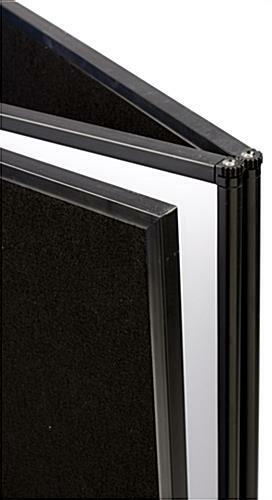 One request is that I be able to mix the boards between hook and loop display with the white board (such as 2 panels hook and loop with 1 white board panel) when using for a display. I look forward to using with plastic sleeves in the future to hold my deliverable information. Thanks for the great review, Danielle. Came in speedy timeframe and very affordable. Thanks! Hi Betsey, We're sorry to hear your product arrived damaged. One of our customer care specialists will reach out promptly to assist. Thank you! Great product -- fast shipping! I can't get over how quickly this arrived -- less than 2 days after placing the order (and I just selected regular ground shipping). The display was well packaged and it is very nice quality. I love that it comes with it's own carrying case (which is large enough to fit other materials like flyers/folders inside as well). Can't wait to put this to use! Thanks for the review, Nicole. When you do try it out, feel free to share a photo of it in use on our Facebook wall! We love it when our customers show off their products "in action!"